Egypt is to welcome back home up to 123 ancient Egyptian artefacts this evening at the Cairo International Airport, after they were discovered as part of an ongoing 5-year investigation into an international smuggling ring in the United States. In 2009, the United States' Immigration and Customs Enforcement (ICE) discovered a woman's Greco-Roman style sarcophagus in a garage in Brooklyn, New York, according to a Wednesday press release, providing a critical break-through in uncovering a major smuggling ring that had illegally brought up to 7,000 cultural items into the US from around the world, including Egypt. 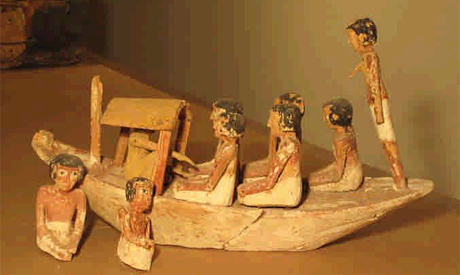 Following leads from the Brooklyn discovery, the US authorities then found an ancient Egyptian model of a funerary boat and figurines at the Detroit airport in September 2010, and 65 ancient Egyptian coins in December 2010, according to the same press release. These items, along with two more funerary boats models, all from the Middle Kingdom (between 2000 and 1700 BC), limestone carvings from the Third Intermediate Period (from 1070 to 664 BC), as well as the remains of human skeletons, have all be repatriated to Egypt, according to Egyptian minister of antiquities Mamdouh Eldamaty. The coins dated back to the Greco-Roman period, he said. Codenamed "Operation Mummy's Curse", the ICE investigation that discovered the ancient Egyptian artefacts, has so far included 16 seizures of cultural object, worth about $3 million in total. The ICE claims to have returned over 80 items to Egypt in four repatriations since 2007.